MUSCAT – 09 April 2018: Artwork by an inspiring Omani female painter has been chosen to brand Al Mouj Muscat's environmentally-friendly transportation buggies as part of the company's initiative to support local artists in the Sultanate. 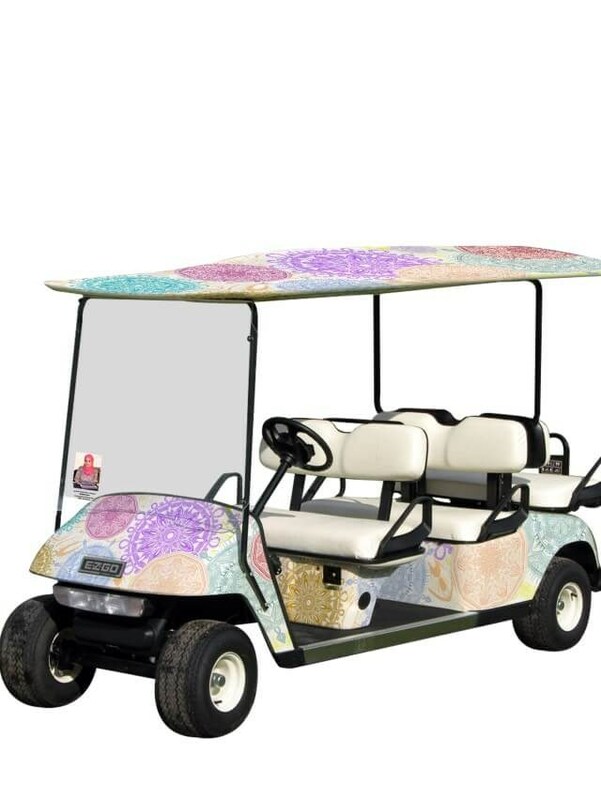 The new initiative is part of Al Mouj Muscat's wider Corporate Social Responsibility plan and will see the destination select different local artists to showcase their artwork on The Walk Buggies – a free buggy service operating within The Walk. The first artist selected to brand the buggies with her paintings is Safiya Al Bahlani. She is an Omani artist, creative designer, and inspirational and motivational speaker who is renowned for painting inspirational poetry on canvas to motivate fellow Omanis with her challenging life story. The physically challenged young woman has found her passion and path through art, advocating for people with special needs and inspiring and motivating others to overcome adversity. She has also previously spoken at TEDx and SAM Global events and held four solo exhibitions. Al Bahlani runs an art studio and gallery to be able to guide others into the beautiful path of the arts. Safiya Al Bahlani commented on her contribution to this initiative: " I am so grateful to have been chosen as the first artist to brand The Walk's buggies at Al Mouj Muscat with my artwork. This is an inspired and unique way in which to showcase Omani talent for all to enjoy and shows just how passionate Al Mouj Muscat is about promoting Omani culture and sharing it with the community". Al Mouj Muscat seeks to strengthen connections to Omani culture for both visitors and residents by sharing a sophisticated representation of Oman in its properties, public spaces and amenities. Having the paintings on the buggies helps create a moving exhibit that shares the artists' work across The Walk. Located in the heart of Al Mouj Muscat's master plan, The Walk receives approximately 9,000 visitors per day and an annual footfall of about 3.2 million. The lifestyle destination is currently home to 70 different retail and dining destinations.